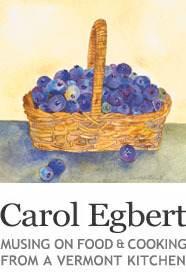 Vermont food from a country kitchen – Carol Egbert - Eggplant – Help! Help! I have found that it is easier for me to paint eggplant than to cook it. After a trip to Sicily, I tried to make the classic Sicilian dish, Pasta alla Norma. I made an acceptable version of this simple combination of pasta, tomato sauce, eggplant and cheese, but I was not happy with the eggplant. It was oily and the skin was tough. I need help. I would love to hear how you cook eggplant so that it is creamy and not too oily. What do you do about the skin? Do you salt it or soak it in salty water? What’s your favorite variety. 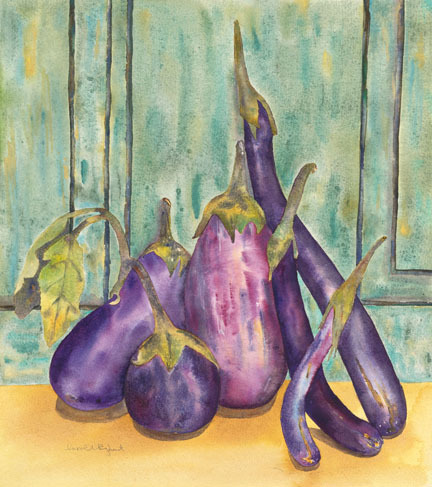 Please leave a comment or a question and if you want to know my ‘recipe for painting eggplants’. I’m confident that you have wisdom to share. Its my first visit here and I am delighted. You are such a wonderful and talented painter, I especially love the paintings of vegetables. Thank you. Thank you for your kind words. The purple’s in egg plants makes them fun to paint. Eggplant really is tricky! I tend to like the smaller, Asian ones, whose skin isn’t as thick, versus the typical dark purple large varieties found in grocery stores — that skin can be a bit tough. I just made a curry with adorable wee eggieplants from the farmer’s market. They cooked down soft, but they were cut down so small in the curry, one would never recognize them immediately as eggplant, but they sure tasted good! Did you sautee them? Were they whole or cut in half? My trick with eggplant is to wash it and them cut it in half, then rub rub the halves together for about 20 seconds. After that let the eggplant rest in a covered bowl for an hour. I don’t know why this method works but I’ve had great success with it. Do you peel them. Do you cook them in lots of oil, small amount of oil? Thanks for you suggestions. How was Sicily? As far as the eggplant goes I always peel it. I salt it when I have the time and then rinse it. I love your picture of the eggplant. Sicily was terrific. So terrific in fact that we are thinking about spending a couple of months there this winter. Thanks for your eggplant advice. I guess I have to give up on the beauty of the skin and peel it before cooking.